What is a primrose? 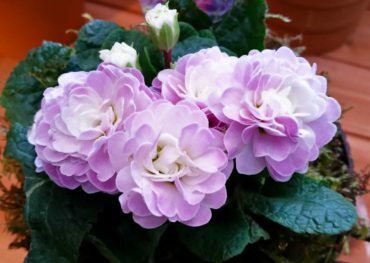 Shakespeare would say in Romeo and Juliet, “A rose by any other name would smell as sweet.” Primulas are not roses, although some of the double flowers of these demure perennials are rose-like. 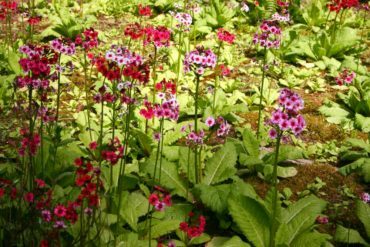 The Latin name primula literally means the very first one, referring to the blossoms as being the first to flower in spring. The plants are as much a part of spring as the daffodil, tulip and apple tree blossoms. Many species and cultivars pack a punch of color at a time when other plants are still waking up from their winter slumber. 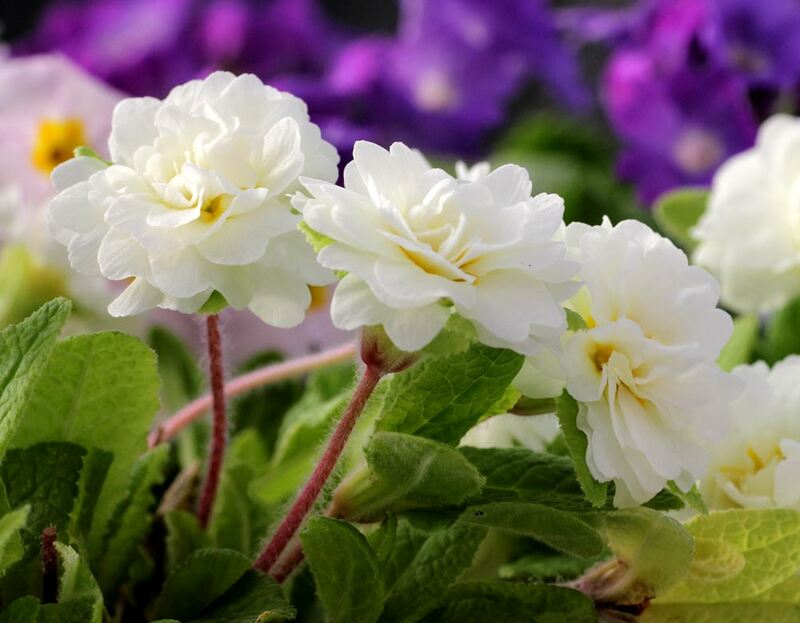 It is not surprising that primulas are popular and sold at almost every store in town. 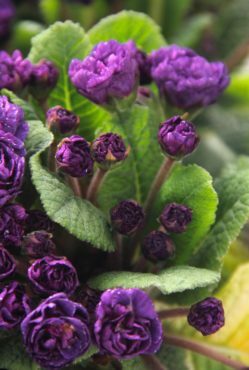 Spring-hungry shoppers are easily enticed into buying primulas offered during the cold, dark months of winter. A spot of color plopped down in a basket on the porch brings a lot of cheer to the rain-dreary soul. Through history, people have had a relationship with this genus. Long interwoven in the English culture, primroses turn up in folk songs such as “The Banks of Sweet Primroses” and are the star of many silly superstitions. For example, “beware if you raised chickens” — some superstitions claimed that primroses would negatively impact your poultry. If you brought less than 13 primrose flowers into the home, the number of flowers would be the number of eggs each hen would hatch that year and no more. Imagine a documented dispute between two women in 1853. One woman gave her neighbor’s child one primrose flower to take home, so that her neighbor’s hens would only hatch one egg each. The neighbor claimed the woman’s misdeed was successful. Another fowl superstition warned people to not pick the earliest blooming primroses. If you brought the early ones home, fertility decreased in the clutch of eggs the hens were incubating at the time. Shakespeare created the terms primrose path (“Hamlet”) and primrose way (“Macbeth”), yet he used them to illustrate a darker side of humans. 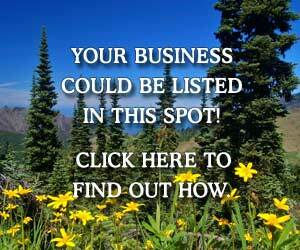 Now these terms are used to signify a more positive expression. Who doesn’t love a primrose? 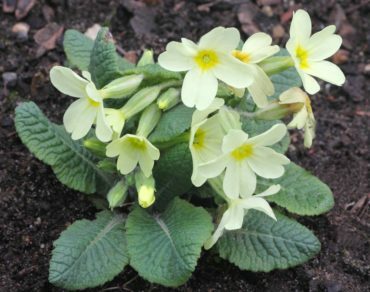 They are not difficult to grow — just provide evenly moist soil for most primroses. Side-dress plants with compost and fertilize the plants in the spring. Every few years, you need to lift and divide them. Replant divisions and pot up extras for friends or donations for plant sales. The candelabra primroses (Primula japonica, Primula bulleyana and Primula beesiana) thrive in wet areas. 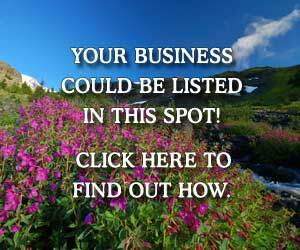 If your property has perpetually wet places, plant these species and cultivars and let them colonize the area. English primroses most commonly sold this time of year and midwinter are Primula vulgaris cultivars and Primula x polyanthus. Less common in the winter lineup of trays are the cowslip (Primula veris). Primula vulgaris may be a common species, but they add color to the late-winter to early-spring garden. Their sweet looks may fool you; they are tough plants. Cheery flowers handle the rain and the cold. 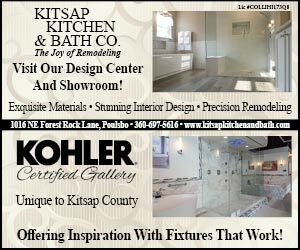 They are a welcome relief from the rainy doldrums that plague this time of year. Most-common primroses are creamy-white to pale-yellow; however, pink, white and even purple forms are found growing in the wild. At one time, the species Primula vulgaris were abundant in woodlands throughout Europe. Often dug up and sold at street markets in Britain, they declined until 1975. Britain banned taking plants from the wild. Replanting efforts and protection brought the plants back and now they are abundant and flourishing in their native homelands again. If you know primulas, you probably are familiar with Barnhaven Primroses. During the depression, Oregon-based Florence Bellis began a journey with primroses with a packet of seed. 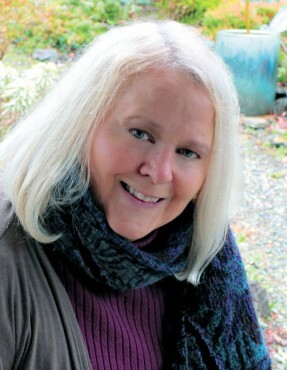 She began not knowing anything about hybridizing, let alone primroses, and taught herself how to propagate her stock. Instead of using a brush to pollinate her plants, Bellis used her finger. Her digits, loaded with pollen, helped her plants set copious amounts of seed unlike the traditional, painstaking work of using a brush. Her methods are now an industry standard for propagating primroses. Bellis established the business Barnhaven Primroses and introduced many double cultivars, which are popular to this day. Her work helped establish the American Primrose Society. Thirty years of crossing and backcrossing is why there are many stunning, clear colors in the flowers, and also why gardeners can enjoy the stable seed strains seen in the market today. Propagating double primroses is not easy since they do not set seed and produce very little pollen. 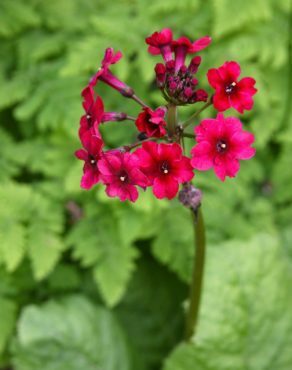 A single primula flower needs to be the seed parent. Collecting pollen from a double flower means hybridizers must dissect it first to reach what little pollen the flower harbors. Barnhaven Primroses is now based in France and continues to use Bellis’ hand-pollinating methods while still propagating the original Barnhaven strains. Primula ‘Miss Indigo’ was one of the Bellis doubles, a result of this work. It has purple, double flowers edged in white. The common name jack-in-the-green (Primula ‘Dawn Ansell’) came about because of the way the small, green leaves surround the flowers like a collar. 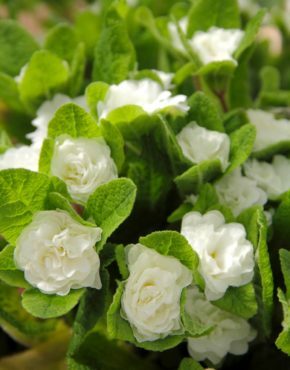 The double English primrose leaves resemble miniature romaine lettuce with double, white roses nestled into them. Primula ‘Dawn Ansell’ is very hardy and easy to grow in the mild climate of the Pacific Northwest. The fascinating Primula auricula ‘Spumoni’ gives tricolored flowers with a scent of honey. Another intriguing attribute to this cultivar is its powder-sugar-like dusting called farina. 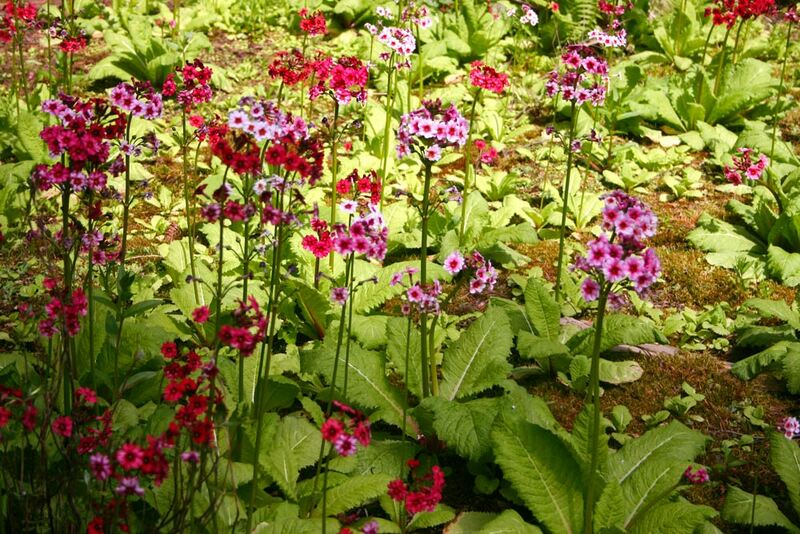 This primula blossoms off and on through the growing season. 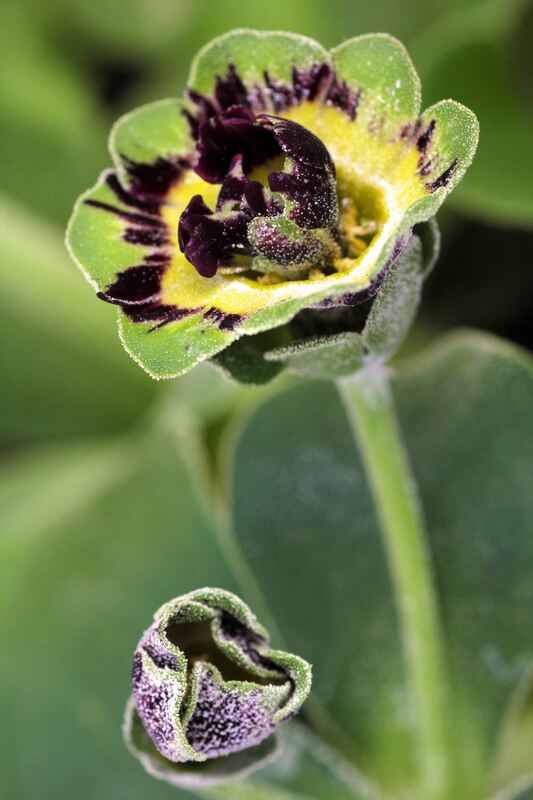 Primula auricula ‘Angelo Hayes’ is a most unusual flower, with purple and green stripes with a dusting of farina. Sometimes another stem emerges from the center of a spent blossom and produces another set of flowers. The auriculas need evenly moist, rich soil, and bright shade to partial sun. Is it a cowslip or a primrose, and how do you tell them apart? The cowslip (Primula veris) is easy to identify in one respect. Your nose will know. When a sniff test of the flower reveals the aroma of apricots, you have a cowslip. Dig it up and you will notice the root fragrance is anise. From as little as two up to 30 flowers bloom on top of long stems; however, the plant will send up shorter stems when grown in nutrient-poor soil. The nodding flowers all face in one direction.